Remember yesterday when I professed my new found love for the latest fall hue? Burgundy, or Oxblood as used by the fashion set. Granted I have yet to find the perfect pre-mixed shade, the images above show me in a mix of Lancome's brown liner, and a no name berry lip stain I found in my makeup box. I'd love to hear your thoughts on your fave beauty brands that do a good matte burgundy lip shade. I'm on the hunt for the perfect cocktail party lipstick! Burgundy lips are so fab! I need to find a shade that looks good on me. I just love how you mix (I feel like I've probably told you this many many times), but every time I look at your blog, I get a new idea! Very inventive and cohesive look! I love it! You executed quite nicely! This color suits you!!! Very fun combination! I love it!! Hi there! Found you through Andee Layne (The Honeybee). Cute blog! I like the Anthro PJ Pants post. I am in love with your jacket!! Its perfect and it adds the perfect edge to your outfit! Great take on burgundy babe! That jacket is killin me!! LOVEEEE! Love the oxblood jacket with those black panels! :D Super chic! This has been one of my fav lip shades for a couple of years now! I normally where a Revlon shade (sorry don't know the name) with MAC Oversexed gloss on top and Buxom Brooklyn is also a good option. Super chic! this is so bold, impeccable style ! would you like to keep in touch through Bloglovin? Awesome jacket! I like how you mixed so many textures in this outfit! Just discovered your blog! I love this look! 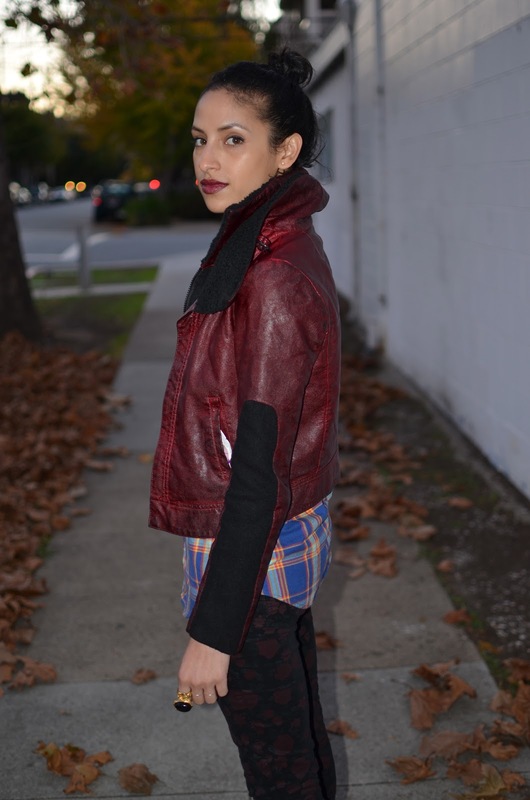 The jacket is fab and the burgundy lips are fierce! Well put together! Following you now! oh, that lip color is fantastic! Amazing outfit! I love your gorgeous jacket and pants! that jacket is killer! i love it! This is a cute look.